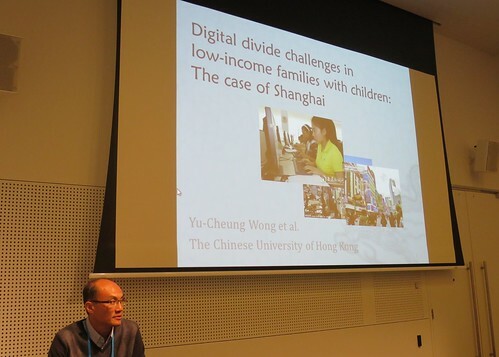 Digital divide challenges in low-income families with children: The case of Shanghai. Paper presented at #husITa14 in Melbourne, Australia in July 2014. The percentage of Internet users in China has increased from 8.5% in 2005 to 36.2% in 2011. Shanghai has reached 64.5% in the proportion of Internet users among its population in 2010. In an increasingly digitally-connected society, access to the Internet for all is a great challenge for most countries. The digital divide experienced by children in low-income families poses very serious threat to social development. Another indirect consequence of the digital divide that hinders the Internet access of children in low-income families is their parent’s inadequate Internet knowledge and negative perception about the Internet. Some hesitate to install computer and Internet access, which are expensive items for them, at home. Even when there is Internet access at home, without parents’ proper guidance, and involvement, children would easily be attracted to games, social media, and entertainments. This creates tensions and frustrations between parents and children when parents attempt to direct their children’s attention to their studies. The tensions might actually ruin the purpose of helping children to benefit from the use of the Internet as children react negatively to the demands and control of parents. This paper presents the findings of study involving a representative sample of low-income and ordinary households with children (10-17) in Shanghai (800 families each). It unveils the parental factors and within-family dynamics that exacerbate the effect of digital divide among children in low-income families in their educational and social outcome in Shanghai, and identify policy options that could effectively address the problem in Shanghai, and other parts of China.